The Yorkshire & Humber Academic Health Science Network has supported Cupris in achieving market launch for its new remote ENT referral service. 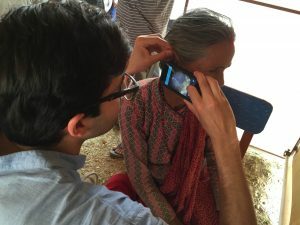 The Cupris otoscope (for ear examinations) clips to a smartphone and enables GPs and practice nurses to securely transmit images to Ear, Nose and Throat consultants, speeding up the diagnosis and treatment of ear conditions and reducing the need for unnecessary hospital referrals. Ear, Nose and Throat (ENT) hospital departments receive a significant number of avoidable referrals. One way to address this problem is to ensure patients see the right person at the right time and in the right setting, to bring care into the community and better use healthcare workers such as pharmacists and practice and community nurses. To do this, the NHS needs simple and affordable tools to seamlessly communicate, securely exchange high quality medical information and remotely ask for expert opinions. Cupris has developed a technology that will radically change the demand profile on secondary care ENT services and decrease significant waiting times. The Yorkshire & Humber AHSN was introduced to Cupris when the company successfully applied for phase one and subsequently phase two funding in a SBRI Healthcare competition for innovations that delivered telehealthcare solutions for people with Learning Disabilities. Yorkshire & Humber AHSN was the lead AHSN for this competition and part of the selection panel. Since that initial introduction, the Yorkshire & Humber AHSN has worked in partnership with Cupris to support the company in developing its innovation to the point that it has been launched in April 2017. This has included supporting the company as a sponsor of the 2016 DotForge Health and Data Accelerator, which provided intensive mentoring, user-testing and market access strategy guidance. The Yorkshire & Humber AHSN then funded an evaluation of the product following a successful pilot with the Medway Foundation Hospital NHS Trust. This evaluation was carried out by the York Health Economics Consortium (YHEC). Throughout the programme, Cupris has involved its main stakeholders in each step of the product’s development, especially around user experience, pricing and distribution. Patients have been interviewed and healthcare professionals have tested the Cupris solution in their clinical practice and provided feedback on further improvements. As well as Yorkshire & Humber, Cupris is part of the DigitalHealth London first cohort and, as such, benefits from support from the three London AHSNs (Health Innovation Network, Imperial College Health Partners, UCL Partners). EMIS was also a partner of the DotForge Health + Data Accelerator and, besides the integration with the EHR (see below), EMIS is working with Cupris to distribute the product through Egton. To increase uptake of the device, Cupris has integrated its platform with the main EHR provider in the UK (EMIS) and is currently halfway through the process with INPS Vision and SystmOne. The Otoscope is CE marked as a Class 1 medical device for use in the EU and MHRA-registered. The Cupris software has been developed to comply with HSCIC’s security standards, which includes the appropriate architecture for separation of patient identifiable information and data encryption and is NHS IG Toolkit compliant. Following a clinical trial within Medway Foundation NHS Trust, the company is in discussions with a number of CCGs (Medway, Lambeth, Tower Hamlets, Croydon, Eastbourne, Hailsham and Seaford) to roll out a remote ENT referral service. The Cupris ENT Service has been successfully evaluated through a clinical trial in Medway NHS Foundation Trust, Kent Community Healthcare NHS Trust, care homes and GP practices. Qualitative results showed that almost all of the participants (98%) felt comfortable and confident about using the Cupris Otoscope and communication platform and were satisfied with the solution. 97% of them were happy for healthcare professionals to discuss their condition via the Cupris system. The clinical trial results show that the technology significantly improves the participants’ understanding of their condition. An economic analysis using the trial data has been commissioned and funded by the Yorkshire & Humber AHSN to assess the Cupris solution cost savings to the NHS over one year. 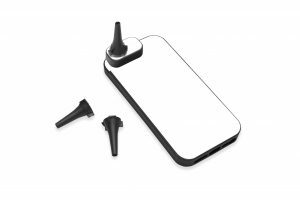 The Cupris Otoscope has been co-designed with patients, GPs, nurses and ENT consultants and has already been shipped to over 200 healthcare professionals in GP practices, Trusts and private clinics in a number of different settings. The key benefits of the Cupris ENT Service include prevention of unnecessary referrals and a subsequent reduction in the number of face-to-face consultations. In addition, the Cupris solution could significantly reduce high Do Not Attend rates. Patients benefit from a quicker and simpler remote assessment by an ENT expert. They may well also avoid attending a hospital consultation if it is appropriate to be treated remotely. They understand their condition and treatment better by being able to visualise what is wrong and to communicate easily and safely with their doctor, which can improve treatment compliance. GPs benefit from quicker feedback from ENT specialists and are empowered by second opinions and guidance received directly with associated images. ENT surgeons have more time for the patients who need care most. It also creates an audit trail to track patient cases over time. It allows them to easily store interesting and educational cases and is useful to train medical students who can share and get an opinion on images they weren’t able to capture before. Finally, health care providers save wasted resources and money and deliver an improved healthcare experience for patients, carers and healthcare professionals. This covers all settings including Trusts and GP practices and can also provide benefits in care homes and in community settings. The Five Year Forward View states that the NHS needs a breakdown of the barriers in how care is provided. The Personalised Health & Care 2020 report highlights the necessity for more effective information sharing across care setting. The Cupris innovation responds to these objectives by making communication simpler and more efficient between all healthcare professionals and with patients. By providing a tool to securely, safely and simply connect healthcare professionals and share clinical images, it enables better integration of community providers into the delivery of healthcare and can improve the efficiency of multispecialty community providers in most of the new models of care. The Cupris solution fulfils the ‘Triple Aim’ of improved health and wellbeing, redesigned care, and wise financial stewardship. The GP Forward View refers to new approaches to workload management, optimisation of the right interface between primary and secondary care and care redesign to ensure people see the right person at the right time in the right setting, including self-care where appropriate, for staff to be able to free up capacity thus ‘releasing time for patients’. The Cupris innovation enables ENT consultants to free up capacity by triaging remotely unnecessary consultations and aids improved communication between GPs and consultants. The same concept can easily be reproduced at other levels including community and primary care to free up time for GPs as well. Cupris aims to sell its remote ENT referral service to healthcare providers that will benefit from avoiding unnecessary face-to-face consultations and transforming those into remote consultations. This includes CCGs, STPs or Trusts that are on block contracts commissioning models. If successful, the project can be easily scaled to other specialties as the same concept of sharing details and images through the Cupris software to a remote specialist team can be applied.